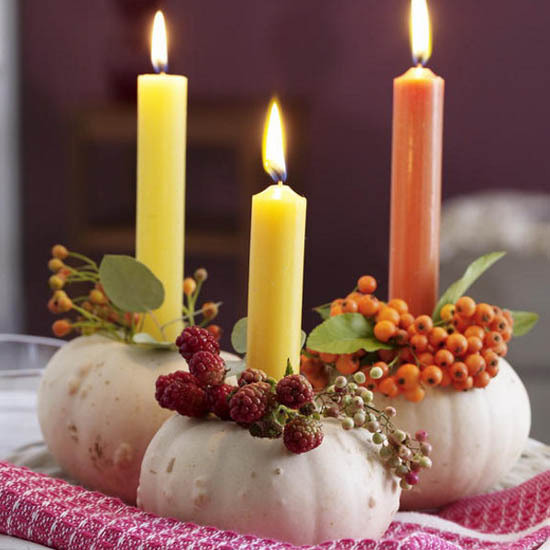 Candles centerpieces are excellent Thanksgiving table decoration ideas. Decorated with berries, they take advantage of natural beauty and organic materials textures. Beautiful Thanksgiving table decorations and centerpieces with rowan berries, rose hips, autumn leaves, chestnuts or acorns look warm ad welcoming, creating unique fall table decor. Candles centerpieces, decorated with rowan berries or rose hips, small tree branches or colorful vegetables, nuts or fall flowers, add color and teaxture, making Thanksgiving table decorations look vibrant and meaningful. Building your candles centerpiece horizontally is one of attractive Thanksgiving decorating ideas for a large dining table, coffee table or dining room storage cabinet. Wide and low candles centerpieces are safe and luxurious. Decorated with grapes, apples, Chinese lantern flowers, rowan berries, rose hips, pine cones and autumn leaves, they bring colorful and elegant Thanksgiving table decorations into modern homes. Low candle centerpiece ideas allow a conversation to flow easily across your special event or Thanksgiving table, while offering striking fall table decorations which will impress your family and guests. Chinese lantern flowers and gourds, apples and chili peppers, apples and rowan berries, rose hips and Paradise apples, blended with candles, small tree branches and colorful autumn leaves, make gorgeous and eco friendly table centerpieces for Thanksgiving decorating and all events in fall. Get cretive and do not worry about following any set pattern or shape. Use nature as your guide for making unique candles centerpieces with vegetables or apples, rowan berries or rose hips, Paradise apples or Chinese lantern flowers, pumokins or white gourds, creating bountiful and wild compositions for a special dinner in fall or Thanksgiving table decoration. Harvest inspired, candles centerpieces can be made in advance and look wonderful till Christmas, adding natural decorative accents to your dining room decor. Candles centerpieces and wild berries bring warmth into fall decor with sensational fal leaf colors ad harvest decorating theme. Citrus fruits, limes, lemons, oranges, pomegranats, bell peppers and aples make surprising and interesting candle holders. Hanging candles and branches with yellow-orange and red berries create dramatic Thanksgiving decorating ideas in fall. As fall weather gets cooler, entertaining and holiday tables setting move indoors. The harvest decorating theme, warm and welcoming yellow-orange and red color accents, simple and eco friendly Thanksgiving table decorations create feative and elegant, interesting and inexpensive fall table decor. Simple informal fall flower arrangements and candles centerpieces with wild berries, carrots and mini pumpkins are the way to bring the natural beauty of fall season, dramatic colors of autumn leaves, fruits and vegetables to Thanksgiving table decor and celebrate the harvest. Candles centerpieces with rowan berries and rose hips will light up a dining room and table decor for days after the holiday flame is out. 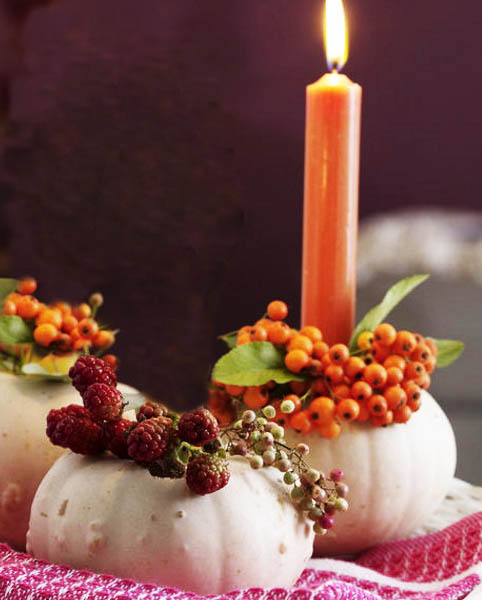 Romantic candles centerpieces, decorated with natural materials, are ideal fall table decorations that enhance the beauty of fall holiday season. Delightful leaves impressions on homemade wax candles, combined with striking red color accents create relaxing and inviting atmosphere, adding pleasant glowing light and jewel color tones of rowan berries and rose hips to Thanksgiving table decorations that highlight and celebrate the season.